Browns Socialhouse – Oakville – We Left Hungering For More! 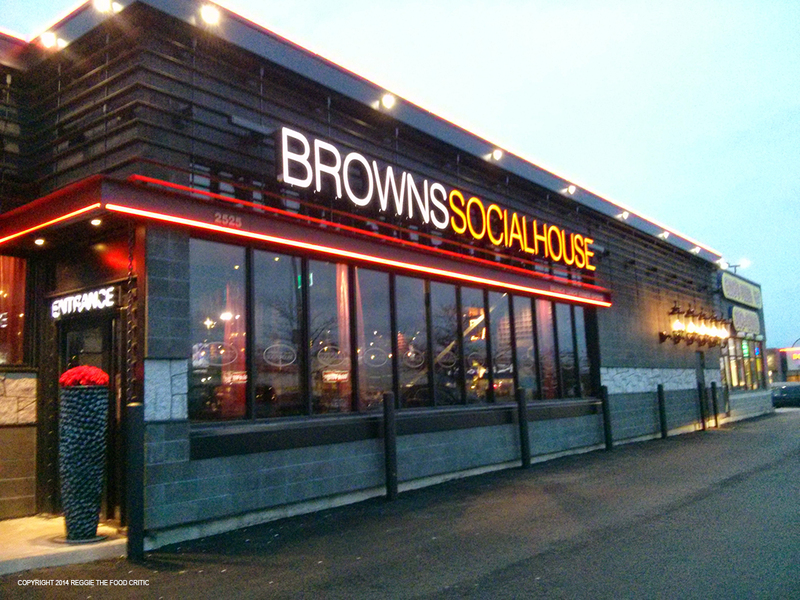 Browns Socialhouse is a chain restaurant headquartered in Western Canada that has drifted into Ontario. Its located just beyond Winston Churchill bordering Mississauga and Oakville. I think the name ‘Socialhouse’ is very appropriate. Browns Socialhouse place a lot of effort in getting the right ambience for their restaurant. The restaurant is very attractive with the right atmosphere for friends getting together or for drinks after work. The décor is classic, modern, sometimes gothic – dark wood and stone and large windows. In the evening its dim, but I’m sure during the day there’s a lot of natural light. The restaurant has these amazing chandeliers throughout that remind me of the Addams Family mansion (that’s where the goth part comes in). The modern part comes in where they have marquee lights as signage. The use of the long tall tables set in the middle of the room seems to be the trend of restaurants these days. So the emphasis on their atmosphere as a gathering place is first, and I feel the effort Browns Socialhouse places on their food is secondary. Here is my review of the food we ordered last night. The menu wasn’t a large menu, however the selection seemed varied and very appetizing. My daughter was dying for sushi, but I persuaded her to try out Browns last night. So she was sort’ve content to order the Tahitian Tuna Bowl (which is raw tuna). 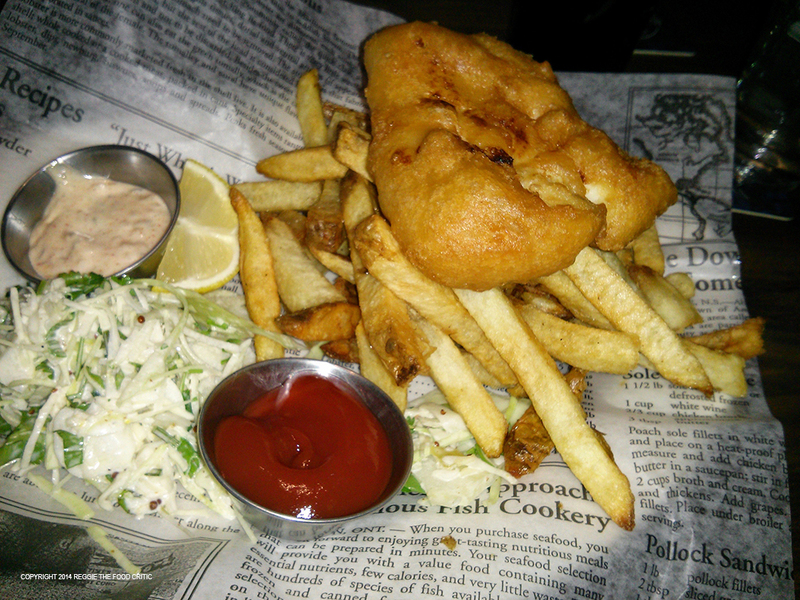 I ordered the Fish and Chips (I wanted to compare this fish and chips with Jack Astors). 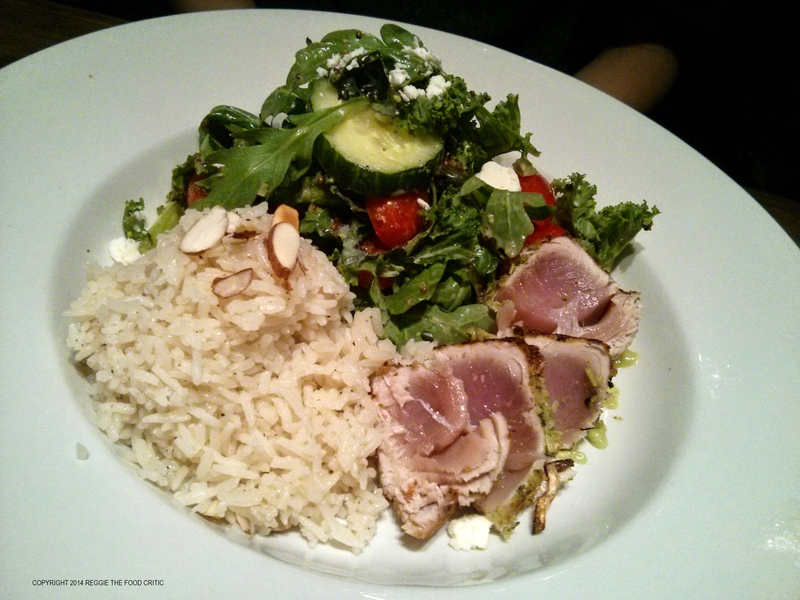 This entrée sounded delicious on the menu – raw seared tuna and almond rice. The portion size that arrived to us was really small. My daughter is never one to finish her food, but she quickly cleaned off everything on her plate. LOL, I had to tell her to ‘slow down’. Either she was extremely hungry, or as we observed the serving was really tiny. She enjoyed the salad which had bits of goat cheese(?). The small serving of tuna ‘slices’ were not nicely sliced as per images found throughout the internet; they came to us on the plate in various chunks and size. It tasted fine (how wrong can you go with simple seared tuna). The almond rice had a creamy flavour and was tasty while it was hot. She commented that the rice started to taste cheap and annoying once it cooled down. So overall, my daughter enjoyed the taste of two out of three items on the plate. We were not happy with the tiny serving size and did not feel the value and price were balanced – we joked that this plate was an expensive disassembled sushi roll. Again, the price was expensive for what we received – a plate with one small piece of fish loaded with fries. The fish was halibut though (I realize halibut is more expensive than haddock). The fish was crispy and tasted good enough. Good batter texture. The tartar sauce was their own concoction in which I could taste dill and cayenne pepper. The fries were safe, nothing offensive. I did not enjoy the cole slaw that accompanied the fish and chips. There was a bitter taste (I can’t quite attribute it to the onion or the parsley that was in the slaw). I prefer Jack Astors Fish and Chips, especially their delicious Yukon Gold fries. (Jack Astors Fish and Chips were pricy as well, but you receive a bigger filling portion of food). I would not order this meal again because its overpriced for what you get. We shared the Key Lime Pie for dessert. LOL, we waited a bit for our dessert to arrive and it came melted! 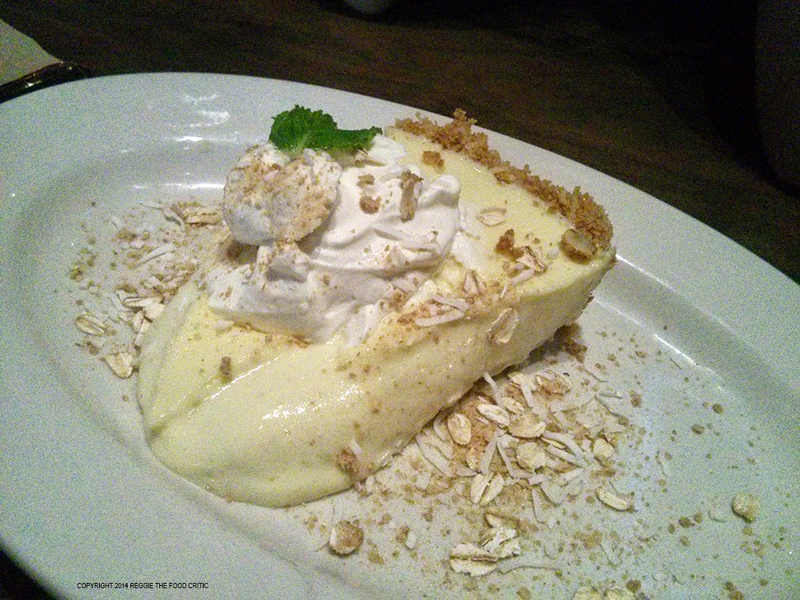 I’ve never really tried key lime pie before, but wow – it was sour, tart. Need a strong coffee with this. I would probably order it again though. I think this might be the only decent priced item on the menu just because the pricing and portion is in line with other restaurants. So, overall I might return to this restaurant, but not too often. Unless I was here to hang out with friends, but not as a first choice for dinner – just because I feel the value to price ratio is not there. The servings are so small! The taste of the food was decent enough (probably a 7 rating). If we do drop by again, I will try one of their burgers. LOL, my pictures turned out too big! I’ll fix them later. :). I’m a bit disappointed that their service and food was not up to par (well, at least not as great as the PR person tried to make it seem). Did you end up giving them the heads up that you were coming? I wonder that had they known you were coming, the food would have been a tad better. No, I showed up like an unexpected visitor. Maybe the food was up-to-par to their level of quality, and I just have higher expectations… I’m sure other customers probably enjoy the restaurant, but just from our experience on our first visit its not somewhere that I would select as a first choice to dine out. I did read a review for this restaurant on another blog where I knew the visit was pre-arranged…. Everyone at the table raved about the place. I use to work near Browns Social House when they first opened in Oakville. I agree that there are some menu items that fall short for the price. However, you should go back for a burger and make sure to get gravy for your fries (Homemade and Yum!). Management was always eager to listen to feedback and step-up when needed. I have been back several times and I would go back again.